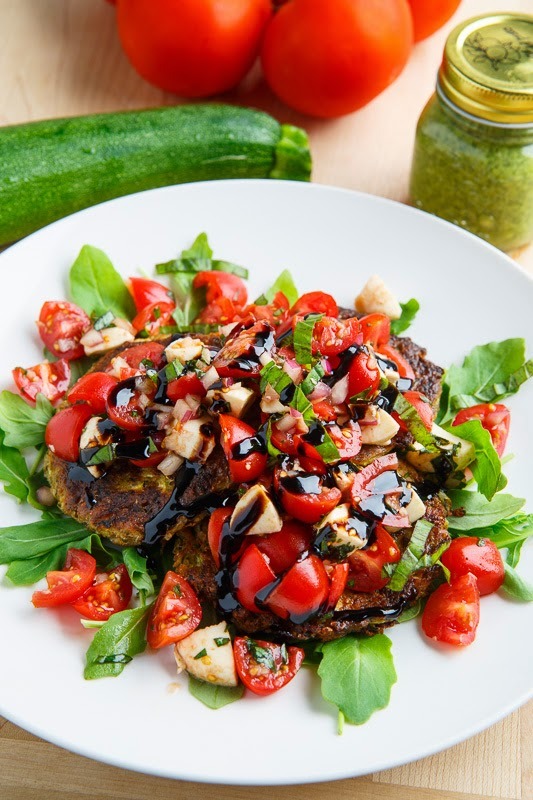 Pesto zucchini fritters served bruschetta style with a fresh tomato caprese topping. At this time of year there is plenty of zucchini around and one of my favourite ways to enjoy it is zucchini fritters! Zucchini fritters themselves are super simple being made of the shredded zucchini, eggs and flour and then you can add any flavourings that you want and basil pesto is a great wat to go! The basil pesto makes these zucchini fritters amazingly fresh, bright, summery and simply irresistible! 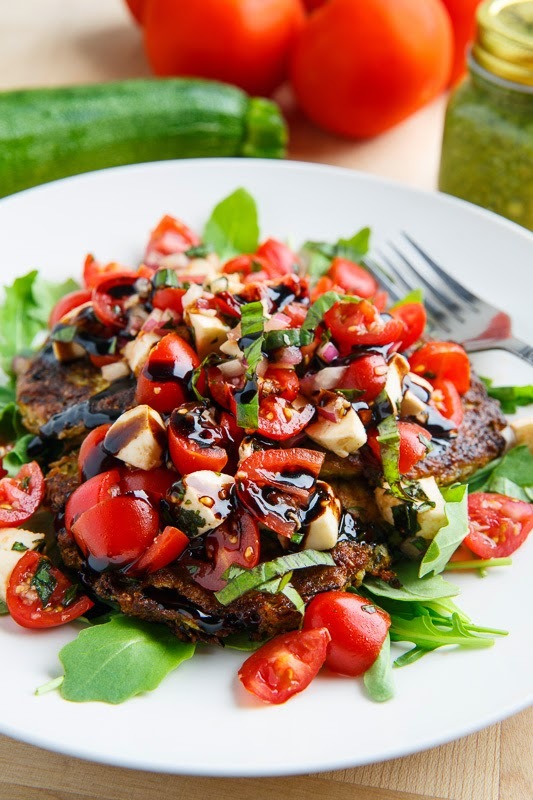 Although these fritters are great all by themselves they are even better when served bruschetta style with a caprese inspired topping with tomatoes, mozzarella and plenty of basil along with a balsamic drizzle! I really could not resist, I mean what’s better than fresh mozzarella? Melted fresh mozzarella! So I threw one under the broiler until the mozzarella melted and the tomatoes were roasted and then I topped it with more of the fresh caprese topping and the result was sublime! The combination of the roasted tomatoes with the fresh juicy ones along with the melted cheese was amazing on the pesto zucchini fritters! Mix everything and set aside while you make the fitters. Mix everything except the oil, heat the oil in a pan over medium heat, spoon the zucchini mixture into the pan, flattening to form patties and cook until golden brown, about 2-4 minutes per side, before setting aside on paper towels to drain. Simmer the balsamic vinegar and brown sugar over medium heat until it reduces and thickens, about 5 minutes. Tip: When selecting zucchini, go for smaller/thinner ones that are firm as the larger ones have more of the seedy centre which has a lot of moisture. Wow, these could not loo any better. It's all of my favorite pilled into one dish!! ya! these sounds so, so good!! Kevin, you are amazing. 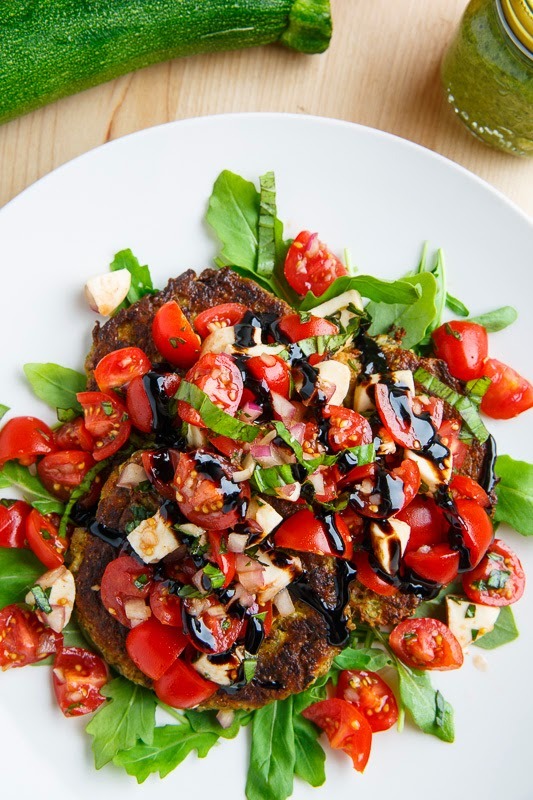 You combined like two of my favorite things here: zucchini fritters and a caprese salad. freaking love this. Wow!! This looks great Kevin! Holy cow! This looks absolutely incredible, Kevin. I have zucchini sitting in my fridge begging to be made into these. YUM! WOW, what a fantastic dish! Just gorgeous and so clever to combine the pesto fritters with caprese – just beautiful and I can already taste the flavors! So incredible and that balsamic drizzle just puts it over the top! Another delicious recipe for the zucchini harvest. I love fritters and can't wait to try your recipe. What a fantastic way to use up everything ripe in the garden. Holy cow! Holy heck yeah. These sound awesome, and different. Pinning for next batch of zucchini from the farmer's market! this looks great but the photo totally looks like the salad is roasted in some way… the cheese does look melted and the tomatoes look collapsed…. but the way you write the recipe, it's just the fresh salad on top of the fritters.. curious about that.. but i'm making it tonight as written! Thanks! HOLD THE PHONE! I just re-read the article and figured it out! Thanks!!! Oh, it looks really delicious. I can't wait to cook it. 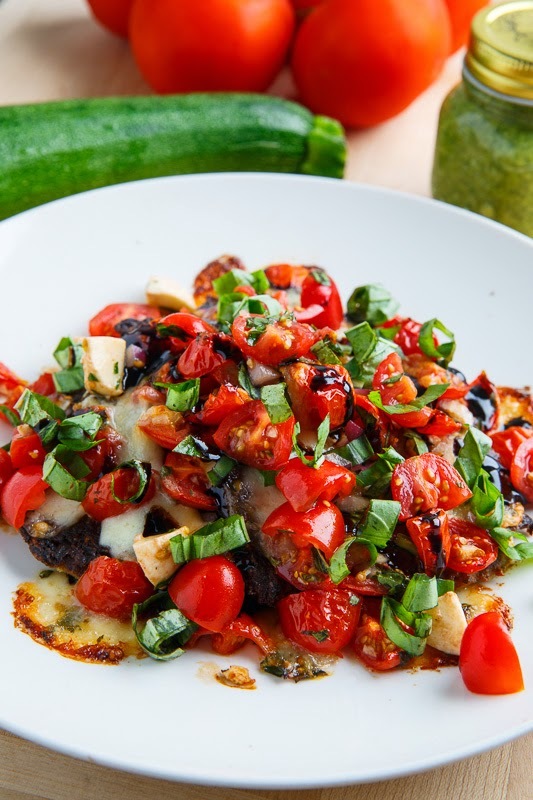 This is summer on a plate – the melted mozzarella cheese and caprese salad put this over the top! I think you put all the best parts of summer in this! Flipping unreal! This looks so yummy Kevin! Beautiful dish! 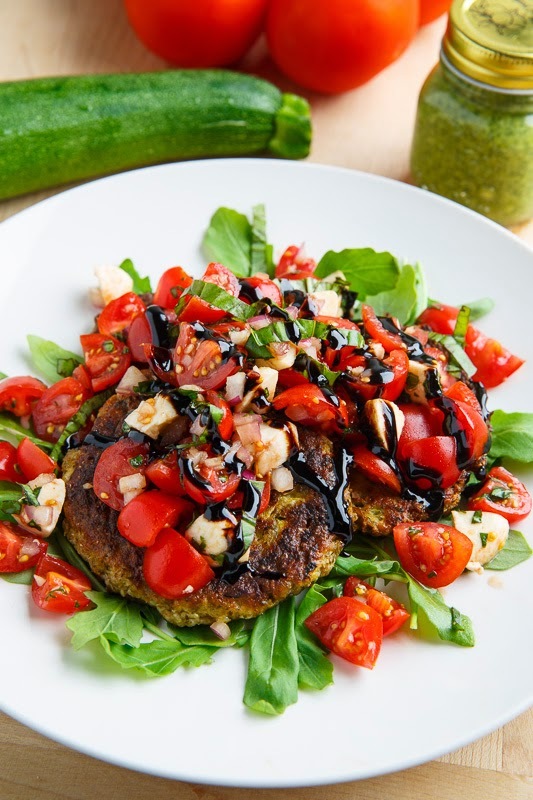 I love the combination of the zucchini fritters with the caprese elements. Yum! Wow! 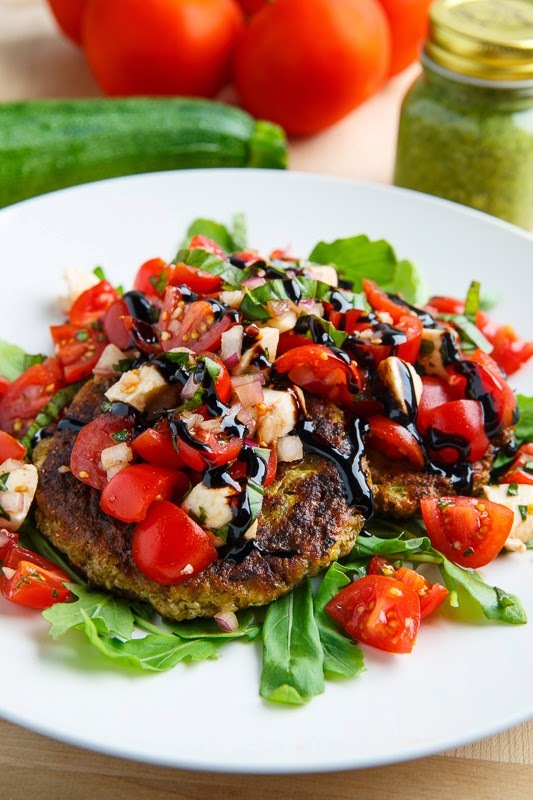 This healthy pesto zucchini fritter caprese recipe is incredible! I'm seriously so inspired right now. I need to add bell pepper to recipe and it would be perfect. Thx for sharing!